​SeaDream Wine Voyages are designed to enhance both your culinary and yachting experience. Explore the flavors and history from some of the worlds most renowned wineries, as well as several less familiar, but equally notable vineyards. Immerse yourself in wonderful flavors while visiting famous wineries as well as several less familiar, but equally notable vineyards. With a SeaDream wine tasting cruise, you can expand or even begin your knowledge through the intricate world of wine. Days are filled with wine tastings and guided tours to the origins of some of the finest wine in the world. Learn and experience the history of the vintage wineries and taste a selected range of their portfolio. Visiting these historic destinations makes it a great experience for non-wine drinkers as well! Exclusive wine tastings are followed by the Winemaker’s Dinner, where our Executive Chef’s degustation menu is complimented with top cuvees from our visiting Winemaker. A different selection of wines will be offered for the Winemaker’s Dinner. An evening unique to our Wine Voyages is all about an unforgettable culinary experience that is incomparable to other wine tasting cruises. Taste only the best and most unforgettable reds, whites and champagne. Specially designed Yachting Land Adventures to compliment the entire wine cruise experience are offered exclusively on SeaDream’s Wine Voyages. These unique land adventures are exciting, additional excursions to fill your days with unforgettable experiences such as hunting for truffles and strolling around local markets on SeaDream’s Signature Chef Walk. Book a Yachting Land Adventure on board and be sure to sign up early to reserve space. 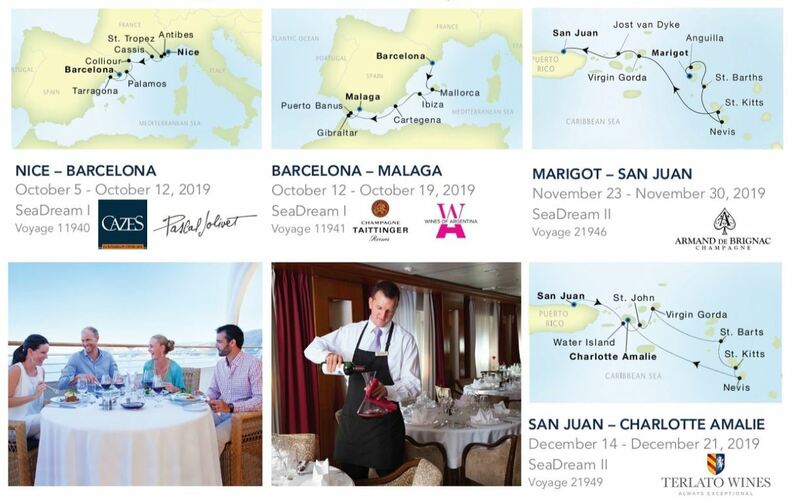 Imagine yourself at the foot of Mount Vesuvius at the Sorrentino Winery or strolling through Cartagena for a culinary and tasting experience–the choice is always yours on a SeaDream vacation. View a Wine Voyage to discover the Land Adventures we may offer shoreside. ​so much more! Taxes and port fees are additional and vary by voyage. Note: we can also do wine club groups with local wineries vintners and winemakers on any of our voyages! Interested? Call today for more information!